LAS Motorhomes pride themselves on the ability to solve a problem and think outside of the box. The owner of an American motorhome contacted me to ask if LAS would interested in taking on the job of rebuilding the Cummins engine that powered his motorhome. This is the point of the conversation where you should say “NO” and put the phone down, not because of the lack of equipment but for the amount of hassle that kind of job generates. Me being me had to start asking questions at this point, my inquisitiveness was asking me “Why did this customer think he needed an engine rebuild?” I asked the question, then the story developed and it went a bit like this! I took my American RV motorhome to one of your competitors complaining that the engine was lacking power and overheating sending the temperature gauge into the red when climbing any slight gradient. Our competitor changed the thermostat and said the motorhome was okay now. 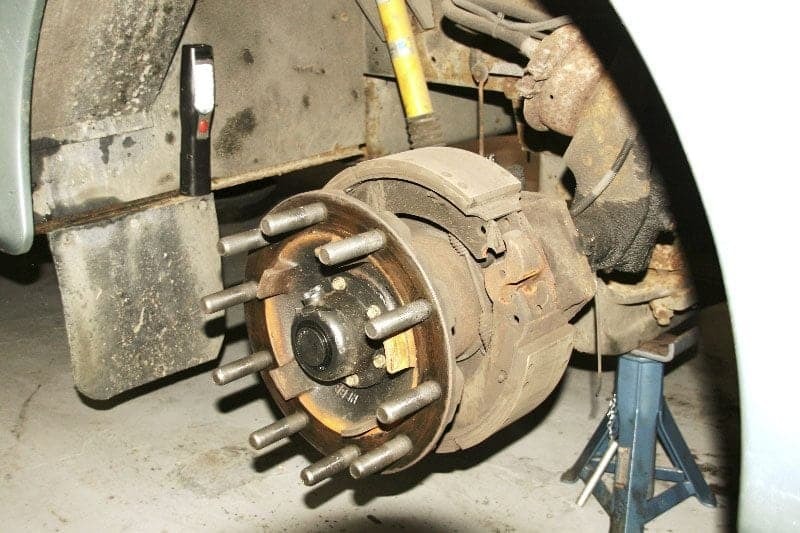 The owner paid the bill and went on his way only to find out it still overheated, so he returned the American motorhome to the competitor’s workshop. They drained the water from the radiator and after carrying out this operation they informed the owner that there was a lot of dirt in the radiator and the water was very brown. 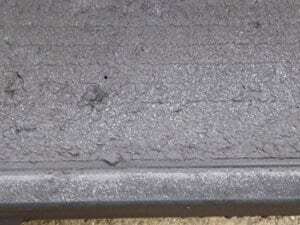 The competitor refilled the radiator with new anti-freeze mix, road tested the vehicle and reported that the engine was not overheating anymore. Following this the owner was presented with another bill which he reluctantly paid and went on his way. On the return journey from the competitors workshop the vehicle had to climb the slight gradient on the M6 motorway to “Yes you guessed it” find the vehicle starting to overheat again. By this time the owner was not happy to say the least, he returned it yet again to the competitors workshop. 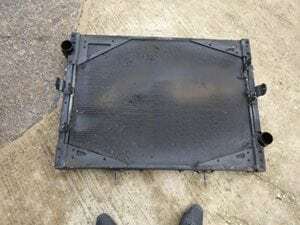 This part of the story is unprintable, the competitor steam cleaned the outside core of the radiator and gave the vehicle back to the owner with no bill this time saying that the cause of the overheating was either a cracked cylinder liner or a blown head gasket. At this point the owner had had enough and lost all trust in the competitor and took the overheating vehicle home. One of our customers spoke to the vehicle owner via the internet and they advised them to speak to me at LAS Motorhomes. My advice to the owner was that I would take a look at it if he could leave the vehicle with me for a few weeks because at this present time I was so busy, the owner agreed. 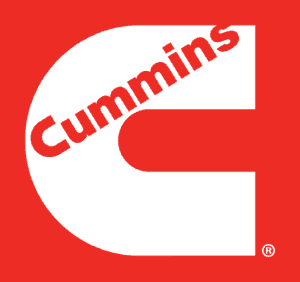 For a bit of background information a Cummins engine with a blown head gasket or cracked cylinder liner will show certain symptoms, pressurising of the cooling system for one, water in the engine oil is another. The engine showed none of these symptoms, I contacted the owner and asked him what happened when the engine started to get hot? The answer was that the vehicle started to lose power. I then looked into the past history of the engines ECU to find nothing that would explain the fault. The engine was then connected to my computer and I got one of my team members Adam to read the computer and answer my questions as I drove the vehicle. I asked Adam to shout out the engine temperature as we were driving along, it wasn’t too long before I realised that the engine was warming up quite quickly. My next question was “What is the charged air temperature?” This particular engine has an intercooler behind the radiator so when the intake air is compressed its temperature increases. The job of the inter cooler is to cool the air making it denser allowing more air to enter the cylinder which in turn gives you more power. To me this charged air temperature was too high for the ambient temperature which was around 5 degrees celsius. The vehicle was then driven back to the LAS workshop and left to cool down. From this I was 100% certain that I knew what the problem was and the best of it was it only took me 1 hours labour to diagnose it £50.00, my competitors had charged £850.00 + VAT and still had no idea. 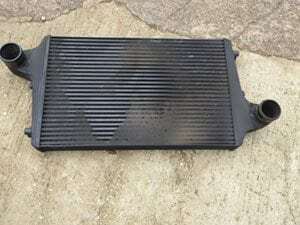 I instructed Adam to remove the radiator so we could have a look what lay between the radiator and intercooler. 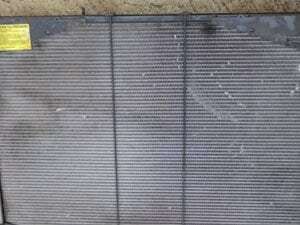 As you can see when the radiator was removed the outside core was completely blocked. 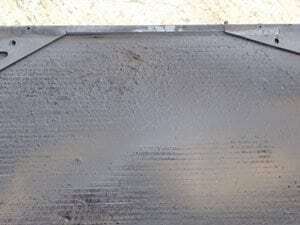 If you take a look at the intercooler pictures you can see the problem, the core is blocked. The air would have difficulty in passing through the radiator, this means that the fan is unable to blow the air through the radiator to cool the engine coolant. This would explain the overheating of the engine. 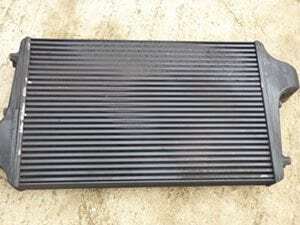 The intercooler is fitted behind the radiator which would mean the engine fan would not be able to blow air through the intercooler or radiator. What would happen is the radiator would get very hot which in turn would heat up the charged air from the turbo charger. This heated air would become less dense meaning less air would be forced into the cylinder giving reduced power. All I can say is the engine did not have a blown head gasket or cracked cylinder bone. All it needed was a team who knew what they were doing to diagnose and repair the fault in the first place. The American motorhome owner thinks we are great, the downside is that this bad experience has cost the owner £1,020.00 for work that was not needed. LAS motorhomes on 01604 861999. When we carry out a service at LAS Motorhomes we complete a number of checks. One of these checks is to test the emissions.